We know as teachers, you dread hearing another assessment or test is required for your students. Let’s face it, you already have very limited time to teach, assess, analyze, and report the results of all your hard work without something new being thrown into the mix. When we heard the state of Illinois now requires school districts and kindergarten teachers to do the Kindergarten Individual Development Survey (KIDS) within the first 40 days of school, we knew we had to do something to help. Obviously, it’s possible to do these assessments within that narrow window of time, but not so likely to get done without teachers wanting to pull their hair out from all the stress added onto an already busy time of the school year! If you are a kindergarten teacher in Illinois then you know the evidence for KIDS should be collected in the first 40 days of student attendance, beginning with the first day of school, and entered into KIDStech during a two-week window (one week prior to and one week after the 40th day of student attendance). ESGI has partnered with Adam Peterson to add ESGI/ILKIDS aligned assessments to offer you a faster way to observe, monitor, track, and record the data needed for the required ILKIDS Domains. Adam Peterson is a kindergarten teacher and vlogger known for his social media channel Teachers Learn Too (@teacherslearn2). He has taught kindergarten for the past 13 years in Illinois and has recently started traveling the country as a presenter of all things K! We know what you’re thinking… “Hey ESGI, the 40 days are over, my tests are done, I survived!” Now, think back over the past few weeks and how much work it was to get your kindergarteners all settled into school, acclimated to your classroom, assessed and then you had to enter that data into the KIDSTech system. This probably involved lots of paper assessments and long hours outside of the school day to gather the data. Wouldn’t you like the process be much easier the next time around? Well, our ESGI/ILKIDS aligned assessments have onscreen directions and images so you can breeze through your KIDS testing in no time! 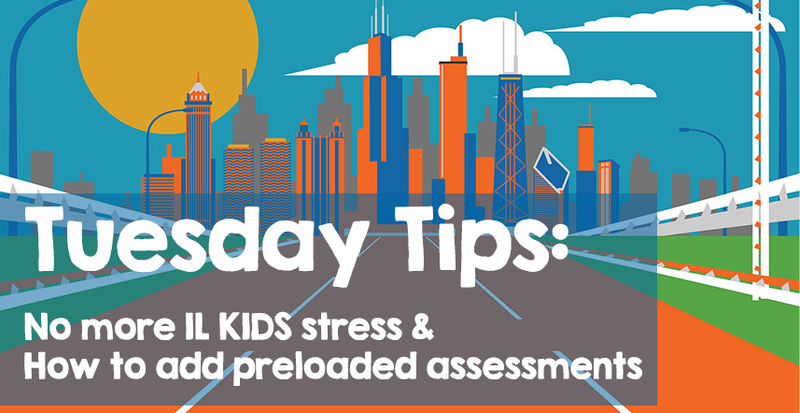 Plus, with our system, you can continue to assess your students the two or three additional times during the school year as the Illinois State Board of Education has recommended in their KIDS FAQ document here. ESGI is designed to inform instruction with real-time student data and show you progress over time as you continue to assess your students. If you are not currently an ESGI user, you can try it for FREE for 60 days and save $40 off your first year’s subscription when you use the promo code TEACHERSLEARN2. Click here to start your free trial. For more information on KIDS or to access the KIDSTech system to load your 14 State Readiness evidence for your classroom, visit the Illinois State Board of Education page here.